Middle East Perspectives by Rick Francona: Operation Odyssey Dawn - who's on first? Operation Odyssey Dawn began on March 19 to impose a no-fly zone over Libya and protect Libyan civilians from the military forces still loyal to Mu'amar al-Qadhafi. There is, rightfully so, much confusion as to who is in charge, who is doing what and where the operation is heading. Much of that is by design. The Obama Administration, being sensitive, overly in my opinion, to the perception of the United States in the Arab and Muslim worlds, is reluctant to be seen as attacking or leading attacks on an Arab country, when in reality that is exactly what is happening. For this reason, the United States delayed, or "dithered" according to some analysts, taking unilateral action against Libya, preferring to secure Arab League and United Nations sanctions for the attacks. In the President's thinking, if the attacks have a European and even better, an Arab face, it might pose less of an image problem for Obama and the United States. It was also this thinking that determined the makeup of the initial attack package. The first shots in Odyssey Dawn were fired by French pilots, followed by British pilots. 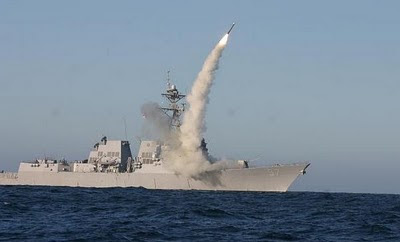 Only then did the United States Navy join the fray with a massive barrage of Tomahawk cruise missiles. The attacks by the French and British pilots, while effective, were not the opening attacks to establish a no-fly zone; the missile strikes were. The scores of Tomahawk missiles were aimed at the initial target set in any no-fly zone operation, the integrated air defense system. To effectively deny Libya the use of its own skies, you must take control of those skies. To do that, you must destroy or otherwise neutralize the ability of the Libyans to challenge your control of their skies. The missiles struck surface to air missile sites, radar facilities, and the command and control communications centers that manage the system. The Tomahawks were followed by four B-2 stealth bombers, able to fly undetected should any radars remain operational, dropping 64 MK-84 2000-pound GPS-guided bombs on other air defense system targets. Those bombers flew from and returned to their base in Missouri. Initial reports indicate that the integrated Libyan air defense system has been largely destroyed. That said, there are still many air defense weapons in the country. These are the antiaircraft artillery guns seen firing in the news reports emanating from Tripoli. These guns are not tied into the integrated system and act independently. Most of this fire can be avoided by staying at medium to high altitude. Likewise, the Libyan army possesses a large number of short-range SA-6, SA-8, SA-9, SA-13 and Crotale missile systems, as well as the man-portable shoulder-fired SA-7/-14/-18 family. These operate under local army control and not the integrated national air defense system. Most of these weapons will have to be destroyed or neutralized before complete control of the skies is assured. I am not sure the Arabs and Muslims whose perceptions Mr. Obama seems concerned about were fooled. The reality of the operation is becoming clear - the French fired the first shots. With apologies to the Bard, a friend described it as "Cry havoc and let slip the 'frogs' of war...."
Since then, the majority of the ordnance is being delivered by the American military using Navy T-LAMs, Air Force B-2 bombers, and Air Force F-15 and F-16 fighter aircraft. I did see a U.S. (Navy or Marine, not sure which) F-18 at Sigonella; they may be providing electronic warfare support, something at which the Navy excels. Taking down an integrated air defense system like the one in Libya requires a certain amount of expertise. The most experienced and effective military in the world at doing this is that of the United States. We have done it in other places and are quite good at it. We possess the weapons, the intelligence and surveillance assets, and the requisite know-how to do it effectively. The world knows who did this, regardless of how it is being portrayed. As in most of these so-called "coalition" operations, the heavy lifting is done by the American armed forces. The Arabs know it's us doing the damage. Then again, the Arab League did call for the imposition of a no-fly zone over Libya; the vote was unanimous. As to be expected from the Arab League, we are now seeing some "buyer's remorse." Secretary General 'Amr Musa complained today that the group had only agreed to a no-fly zone, not attacks on Libyan installations, or as he put it, "bombardment of civilians." What hypocrisy. Both Secretary of Defense Bob Gates and Secretary of State Hillary Clinton were quite clear that the establishment of a no-fly zone begins with attacks on Libya's air defenses. Given the seeming waffling on the part of the Arab League, it will be interesting to see if Qatar, the United Arab Emirates and Jordan follow through on their commitment to provide fighter aircraft for the no-fly zone over Libya. It would be useful to see an armed fighter aircraft bearing the flag of an Arab nation on patrol in the skies of Libya. As I have said in the past, when all is said and done, the majority of the operations will be done by young Americans. We've always been on first.